The United Kingdom’s pet care market is one of the biggest in Europe, with 44% of people claiming to own a pet of some sort. And we’re willing to spend on them. Research suggests the retail value of pet care products in the UK topped a record-breaking £7.16bn in 2016, with the pet pampering market growing by 25% since 2010. While the average UK pet owner spends around £1,252 a year on their pet, dog lovers can indulge their four-legged friends further with a range of grooming services, massages, and even pilates classes especially for pooches. When did the dog grooming business boom? Pet pampering is nothing new, but what’s remarkable is that it has survived recessions and austerity to become more popular than ever. Back in 2013, The Guardian reported that the pet care sector was expanding, with 66% of owners admitting to “treating their pet with as much care as they would a child”. What are pet owners spending money on today? A trim, blow dry and clipped nails just won’t cut it anymore. We’re all becoming more conscious about making sustainable, healthy food choices, and our pets are no exception. For those who choose to avoid synthetic or potentially harmful ingredients, natural cat and dog food, cat litter, flea repellents and even grooming products are seeing a spike in sales. While Pets at Home and other chain pet stores offer high quality grooming services on site, 6 in 10 dog owners use small independent businesses when shopping for their pets. Add a touch of class by offering luxury shampoos, scented spritzes and even pick-up and drop-off services. From pet massage to canine reiki, there is a wide range of holistic treatments designed to relax, rejuvenate and even rehabilitate tired or injured dogs. Specialist centres offer training and courses in animal massage therapy. It’s not always convenient to take your pet to the parlour, but entrepreneurial groomers bring treatments – and treats – to your dog’s door with mobile grooming vans. Yes, you read that right. Perhaps the rise of photo-sharing apps like Instagram is to blame, but it’s never been chicer to celebrate your canine’s big day with a new toy and a birthday pup-cake (that’s a doggy cupcake, if you didn’t know). Run a pet grooming business? 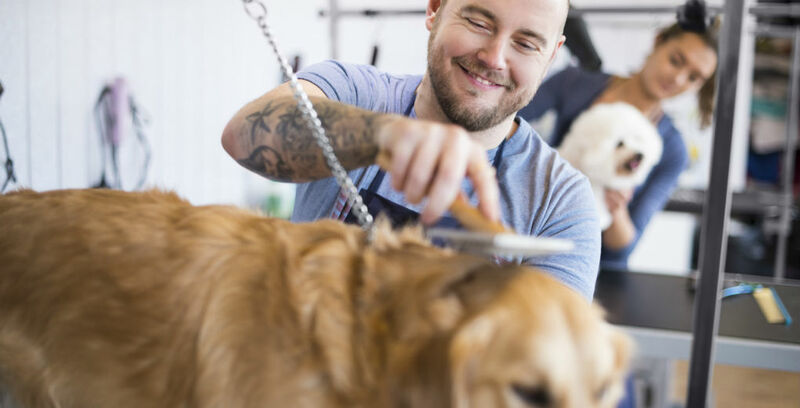 Independent Insurance Bureau Ltd offer a range of business insurance options tailored to the exact nature of your work, including cover for specialist dog grooming equipment, retail stock and appropriate public liability. Get in touch on 01530 415271.